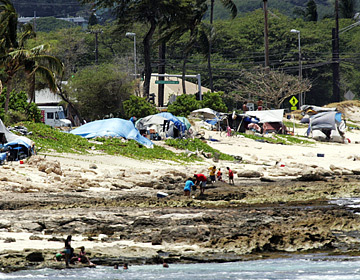 People used tents as homes yesterday that were spread along the coast near Ulehawa Beach Park in Nanakuli. Three city beach parks on the Waianae Coast will undergo major renovation sometime after September, possibly forcing relocation of hundreds of homeless people. "I want to make it clear here: It's not a targeted approach here at the homeless. We're really talking about cleaning up our parks," Mayor Mufi Hannemann said yesterday. The mayor's announcement about the cleanup of beach parks in Maili, Nanakuli and Keaau comes months after advocates for the homeless criticized his administration's handling of the night closure of Ala Moana Park that led to 200 homeless people being displaced. The administration said it needed to close the park to do a major cleanup and renovation of the park. "I think the fact that we're waiting until September will allow for plenty of dialogue and discussion to take place in terms of the state weighing in, social services providers providing us with some suggestions and then obviously the community," Hannemann said. Hannemann's announcement also came the day before Gov. Linda Lingle is scheduled to hold a meeting tonight in Waianae to discuss homelessness along the Leeward Coast. Linda Smith, the governor's senior policy adviser, said the Lingle administration is worried about city sweeps at parks and beaches in Waianae that could displace the homeless. "Whether that will directly affect people who are residing in some of those parks and using them as shelters is too early to be able to say because we don't know the areas that the city plans to approach," Smith said. "But that is certainly one of our concerns." Smith said although the Lingle administration was able to house many homeless who used to stay at Ala Moana park in a temporary shelter, Waianae might call for a different solution. "That doesn't mean that the kind of lessons that we learn in the downtown area are appropriate for the people out in the Waianae Coast," she said. The city first plans a $350,000 renovation of Waianae District Park, but the park will not be closed at night because there is no one currently living in that park. The work will include repairs to the multipurpose building, painting and minor repairs to the gymnasium and outdoor play courts. The city then will turn its attention to the three beach parks where the work will include painting and repairing the comfort stations, picnic tables and other buildings. Parking lot and beach roads and curbs will be repaired and re-striped. Workers will also do landscaping as well as painting and repairing of lifeguard towers and repairing sprinklers. "We want to get back to what taxpayers would like to see with their dollars that our parks should be available for everyone and not just for one segment of the community," Hannemann said. But Hannemann said that the situation on the Waianae Coast is "a very different situation with respect to many people having been there for many, many, many, many years, that we need to be cognizant of that." Area residents also said the homeless situation is compounded by the fact that some of those living on the beach have relatives in neighboring communities. "Our families already come to beach -- some of them live there already," said Waianae resident Maile Hallums. "This is about the homeless," Hallums emphasized. Kiki Paglioti, a 49-year-old mother of three, has been sleeping alone in a sea-rusted tent sheltered by mounds of sand in Nanakuli for about eight years. She said homeless people should not be blamed for broken bathrooms and sinks because they would never damage the only places where they can shower. She said people camping at parks and beaches should be allowed to stay because they have nowhere else to go and are not harming anybody. She said that since the city started closing Ala Moana Beach Park, more people have been moving to her area and inching closer to Farrington Highway. "We used to have all the tents in front of the park. We would tell people to stay out of sight, out of mind," said Paglioti, who was evicted from a spacious home for not paying rent for three months while having problems with a boyfriend.